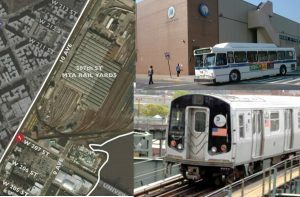 Group PMX’s staff has served in a consultant capacity to the MTA New York City Transit Authority’s Capital Program Management department, supporting both design and construction projects for rail yard and bus station facilities. Their tasks have included the development of design estimates, preparation of Transit Authority Force Account Estimates and in-house engineer’s estimates, review of design consultant’s cost estimates during all design phases, and review and analysis of change orders. 207th Street Rail Yard Boiler System Upgrades and Site Remediation: Design for an upgrade of the existing central boiler plant with boiler/burner replacement, installation of electrical steam generator and water heaters, replacement of steam distribution equipment, replacement and installation of steam and water lines, remediation and installation of aboveground fuel oil tanks, and rehabilitation of site area. Upgrade of Fuel Oil Storage Tanks at 207th Street Rail Yard: Conceptual design development and final design for the upgrade of the fuel storage capacity and code compliance remedial work for fuel oil tanks serving the central boiler plant. Mulry Square Ventilation Building Construction: Subsurface investigation, sitework / excavation and soil removal. 54th Street Rail Control Center: Subsurface investigation, sitework / excavation and soil removal in collaboration with concurrent site improvements and upgrade of building bollard system projects. Hudson Bus Depot Pier 57 Redevelopment: Sitework / excavation and soil removal in collaboration with a private sector commercial redevelopment project during post-acquisition of the former bus depot. Jackie Gleason Bus Depot Concrete Vault Restoration: Excavation and concrete for the restoration of below ground concrete vault.